The hotbed of dancing in the United States can be found in an unlikely location. The population of Orem, Utah is only 84,000— yet one in 40 is a dancer. Several of Orem’s dancers have gone on to win regional, national and world championships. But succeeding in Orem isn’t easy. The city is home to two of the most elite dance studios in America, each owned by a fiercely competitive and hard-driving dance instructor. The studios are just a stone’s throw from one another…and the owners used to be partners! Needless to say, the rivalry between the dance studios and their owners is as fierce as the competition among the dancers. Each week, the studios participate in dance competitions and each week they fight for 1st and 2nd positions—always with the ultimate goal of triumphing over the other. DANCE RIVALS is produced by H2R Productions with Derek Hough, Christian Horner, Adam Rosenblatt and Jamie Rosenblatt serving as Executive Producers. Hey Dancettes, remember Dancing With The Stars Season 6 with Marissa Jaret Winokur, Kristi Yamaguchi, Shannon Elizabeth, Priscilla Presley, Mario, Marlee Matlin, Cristián de la Fuente, and Jason Taylor? Well, on Super Bowl Sunday, you can watch it on the Game Show Network. Below are some details from Broadway World. GSN will celebrate Super Bowl Sunday with a star-studded, captivating half-time show that lasts all night as DANCING WITH THE STARS, Season Six, comes to GSN. GSN will air seven episodes of DANCING WITH THE STARS, Season Six, on Sunday, February 3rd from 5pm ET to 3:30am ET. First of all, thanks to all of you for such a great response on Randall’s Costume Retrospective from week 1 of season 4! Glad everyone is enjoying his commentary as much as I am 😀 Now let’s see what he has to say about the costumes from week 2, shall we? 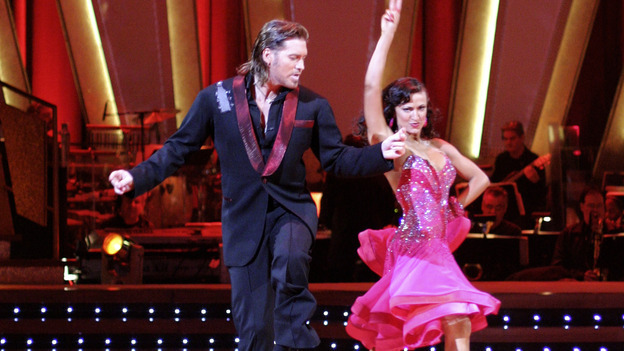 As promised, I am excited to bring you the first installment of our season 4 “costume retrospective” with Randall Christensen, the costume designer for the show from seasons 2-12 of DWTS! You’re in for a real treat, guys – in this edition, Randall not only reveals his inspiration for each of the couples’ costumes, but also explains how the costume department at the studio came to be, some interesting challenges that posed by Heather’s weekly transcontinental traveling, and what you DIDN’T see in Joey & Kym’s disco costumes 😉 Read on! Below is another promo Carson and Karina did for Kasa.com in Santa Fe, NM leading up to tonight’s premiere of past episodes of Dancing With The Stars airing on the Game Show Network. They dish on Season 13 and the family they found. They talk of the costuming department. Carson even talks of coming back for Season 14 and being a guest judge or being part of the band. I’m not sure if he’s being serious or not, but, I’m game! How about you? LOL! Here’s to tonight at 6 p.m. ET on GSN. In cased you missed it and if you’d like to watch Part 1 of Karina and Carson being interviewed some more, go here. Don’t forget! Tomorrows the day! This guy isn’t on Season 4…or is he? 🙂 Since we don’t get to see him most of the season, I’m adding him here. 🙂 A girl’s gotta have her fix. Don’t forget the fun begins on Saturday, Jan. 21st at 6 p.m. ET on GSN. To view all of our previous postings leading up to this event, go here.